Nong Sariam Reservoir Located at Ban Ton Phung Moo 9, Yuwha District, San Pa Tong, Chiangmai. Travel to Nong Sariam using route 108 (Chiang Mai - Hod) through the San Pa Tong district about 3 km and then split to right about 300 meters to reach Nong Sarum. Nong Sariam is a large swamp. The area of about 150 rai, located in Moo 15, Yuwha Sub-district, has been developed by the relevant government agencies and local administrative organizations. For to be a tourist attraction. And a comfortable recreation place. Good for a place to rest. Original condition, before developing into a swamp filled with weed-covered water and so dense. People can walk, it is a wonder of nature. 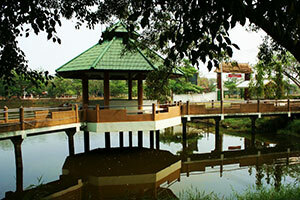 Nong Sariam is one of the attractions of San Pa Tong district. From telling and inquiring old people living around the area of Nong Sarum. There is no written record of the history of Nong Sariam. Evidence that the original village name "Sri Don Chai" has a population of about 100 households. Most of the villagers do farming and fishery. Before the 12th lunar month Headman had a meeting with villagers to prepare event. It appears that this year drought. Food with less. One villager suggested that he had fish in the swamps along the Ping River and found that there was a lot of fish and a giant eel. In the morning, the village headman announced to the villagers to fish in that swamp. Except for the Bau Keaw‘s house. Because she is a widow. Do not want to deal with. Villagers go to fishing at the Nong Rim Ping River and get the giant eels and share to cook. Except for the Bau Keaw ‘s house which does not eat giant eels. At night it is raining heavily and earth quake. Finally, Sri Don Chai village are collapsed. but Bau Keaw ‘s house not collapse and become a shoals. It’s call “Don Mae Mai”. Today, the Department has conducted dredge. Make a reservoir and do the road around. Nong Sariam is a tourist attraction of San Pa Tong. Travel Use private car and no bus service. Approximately 30 kilometers from the city and takes about 2 hours.